Nissan's second-best selling model, after the beautiful mid-sized Altima sedan, is the Rogue compact crossover. The Rogue was one of the founders of the CCSUV market and quickly dominated it with its combination of style, drive-ability, and versatility. Now, Nissan has redesigned the 2014 Rogue, launching a new design that is in tune with the automaker's current design language (a look that was introduced with the flagship Altima, Sentra, and popular Juke). They've also added a roomier interior with optional 7-passenger, 3-row seating and an updated suite of standard and available tech, audio and navigation options. The Rogue's European counterpart, the X-TRAIL, made its debut in Frankfurt, Germany today at the Frankfurt Motor Show. You can see video of that at this link. This new, global platform that the Rogue uses will be offered in several nations and markets, with the Rogue being the North American-specific model. 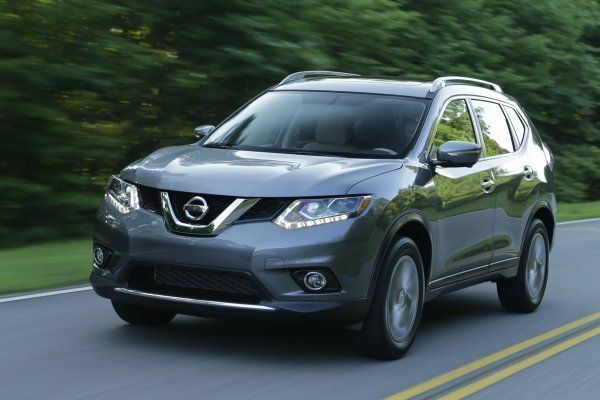 On the outside, the 2014 Nissan Rogue has a completely new style. The look that Nissan fans have loved is still there, but the compact SUV has been made to appear more premium and in line with current design language. Available LED headlights and standard daytime running lights give the Rogue a stand out look while the newly-tuned rear spoiler adds both aerodynamic functionality and a more square look to the overall stance of the Rogue. The 3-row, 7-passenger seating mentioned before comes thanks to design improvements that added to the roominess of the 2014 Rogue. Most of these improvements came from packaging changes rather than extending the size of the compact, so the exterior footprint is not much different from the previous generation. Seat cushion improvements, changed ergonomics, and a reduction of dead space in floor and ceiling meant added interior space. An exclusive new Divide n' Hide Cargo System gives 18 adjustable variations to interior options for two-row models, allowing for clear division and physical separation for cargo and people. The new Rogue has best-in-class front headroom, class-exclusive EZ Flex Seating with a 40/20/40 split second row, and second-row legroom of 37.9 inches with a full nine inches of adjustment. Technology standards include Bluetooth streaming audio connectivity and Hands-free text messaging. Other popular and new Nissan technology options are also offered, including the new and much-acclaimed Around View Monitor with Moving Object Detection for safety and easy parking. The Rogue starts at just $22,490 (plus destination) and Nissan is taking reservations now for November delivery when the 2014 Rogue enters showrooms. Visit NissanUSA.com to get yours. Stay tuned to this Nissan channel for more information on other concepts unveiled in Germany at the IAA. So what do you think? Do you think Nissan hit the mark with this hot new 2014 Rogue?